Christmas is the most magical time of the time, and rightly so. If you’ve ever taken a stroll through your city during Christmas, you’ll notice how homes and shops alike are lit up, which creates a warm and inviting ambience. If you want to bring home that magical feeling all year round, then all you have to do is get your hands on some LED lights. Here are five ways to use LED lights for home decoration to keep your interiors looking festive no matter the time of year! One of the easiest ways of using LED lights for home decoration is by getting yourself a string of fairy lights. Available in a variety of shapes, sizes and colours, fairy lights can instantly turn any space into something whimsical. Because they consist of tiny LED bulbs on a wire, they are the most versatile decorative LED lights for home interior. You can use them to frame your window or mirror, drape them along with your curtains or even hand them from your ceiling. They are sure to elevate your interiors with a touch of magic. You can also read our blog on how mood lighting can create the right ambience. Colourful and decorative LED lights when done right can make your interiors look cool and sophisticated. Since LED light strips and thin and flexible, you can put them in places traditional bulbs wouldn’t usually fit, like under drawers or inside cabinets. Your options on how to decorate home with LED lights is limited only by your imagination. 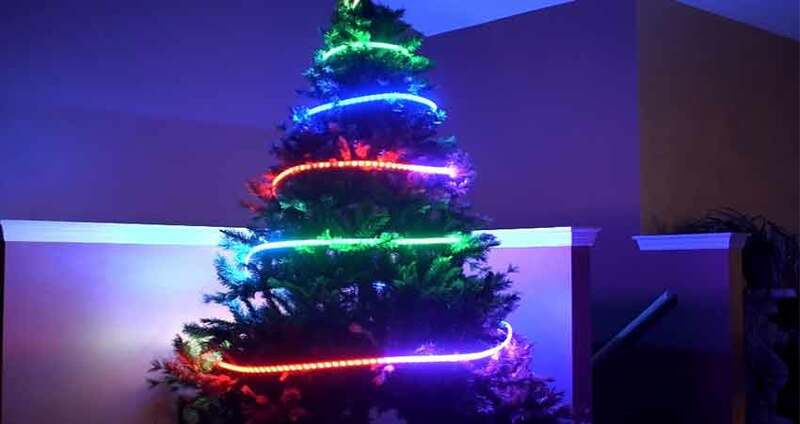 This Christmas, opt for LED light strips in red, green, yellow or white and play around with Christmas themed shapes like reindeer, candy canes, Christmas trees, stars, etc. All you have to do is bend your light strip and secure it in place. This could be on a wall in any room of your choice as a centrepiece. LED lights come in a wide range of colour temperatures. By using the colour temperature of your LED fixtures, you can create some stunning LED lighting ideas for your home. For example, when you combine coloured lighting with negative space, it becomes a powerful concept. Just place your coloured decorative LED lights behind a cut-out of your preferred shape and you can create some stunning results. Some colourful LED lights have blue, red and green diodes that can be set to any colour you want by varying the relative intensity of these three primary colours. Just remember not to use non-dimmable bulbs with dimmer switches. Want to show off your Christmas tree or the bright star hung outside your balcony? All you need are some recessed lights or spotlights. They’re soft and diffused and can create interesting silhouettes and shadows depending on how they are placed. With some red and green LED lights, you can crate and soft and cosy environment at home by using them judiciously and only to light up the corners of your home. Think of a lamp at the edge of your mantle adding some warmth to your interiors, or some yellow spotlight LED fixtures concentrated in one corner of your living room. When thinking of LED lighting ideas for home, you don’t always have to go by the book. Sometimes, it’s best to come up with your own ideas and DIY creations to create a personalised look and ambience. And with DIY lighting, the possibilities are endless. If you have some spare mason jars or vintage glass lanterns lying around, don’t discard them. Place an entire bunch of fairy lights or LED light strips inside them for a feeling of Christmas all year round. You don’t have to stop there. You can even make your own headboard by cutting out small cubicles in some wood large enough to fit behind your bed. Drill holes and place sockets in them. Once this is done, you can either use LED bulbs, strips or fairy lights in a single colour or multiple for a fun aesthetic. We hope we’ve inspired you this holiday season. With a little imagination, you can bring in cheer and happiness all through the year with our led lights for home interior. Head over to Finolex to find the right kind of LED fixtures and let the magic of Christmas permeate every corner of your home! Be sure to check out our blog on 5 things you didn’t know about LED lights for a couple of interesting facts.